A good place for a casual night out. Suitable for small and large groups. I’ve been here a couple of times to say that their quality of pizza is superb. Pasta can be hit and miss depending on what you order. On my most recent visit we had a group of 10, we had to go for their $39pp banquet to share for the table – this is their policy for any group larger than 8. From checking their site now, their banquet price is now $45pp. A $200 deposit was needed to secure our booking. The waiters asked us whether we wanted to pick the mains ourselves, otherwise the chef will do their magic. There were many dishes we wanted to try and as a result we chose to pick our shared dishes. The 39 layers of lasagne was a bit underwhelming, we expected thin layers on top of each other, but it was actually on it’s side. I guess who could really make 39 layers on top of each other? It would be a huge lasagne cake! We were hopeful. It was tasty but I’m use to some meat in my lasagne. Pizzas were all delicious from the wood fired oven. Crispy on the outer with a thin base. I was able to eat a variety of pizzas. I’m someone who would be full quickly if it’s standard to thick pizza base. Would recommend any type of pizza. I think my favourite is still the Calabrese, $25.90. On my first visit, I recall ordering Capricciosa Italiana, $21.50. And it just didn’t taste as good as the menu says. I think it was the artichoke hearts that didn’t taste well with all other ingredients for me. Capriccios Italiana & 39 layers of lasagne are the only two I would not re-order. My friends told me that the Marinara was beautiful, unfortunately i didn’t get a chance to try it, because there wasn’t any left by the time it came to me. haha! We requested two of the Lamb Ragu, it was good, but wished we re-ordered the Marinara instead. The Lobster Linguine sounded very good, but when it arrived, there wasn’t a lot of seafood in the dish, it was hard to split amongst the 10 of us. We did order two of these dishes. 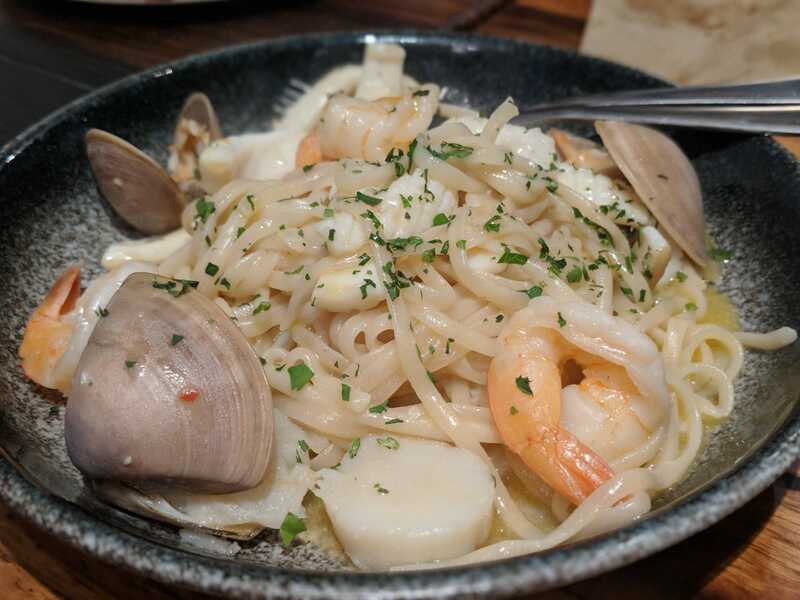 Regardless, the linguine was cooked very well – al dente. Unfortunately, I didn’t take a photo of their salads, but their Radicchio Treviso, $13.50 and Rocket Salad, $13 were very tasty. Out of the two, I would recommend the Rocket Salad, just because it’s fresher than Radicchio – sometimes it get the bitterness from the radicchio. Kindly note that the restaurant charges surcharge on cards incl eftpos. So dining with large groups might be a little annoying to pay for the extra surcharge as the bill is much higher than a smaller group by percentage. If you don’t want to be charged, make sure you bring cash! Overall, every time I visit +39 Pizzeria, I always have a good time. I have good memories here and would vouch for their wood fired pizza and be selective on some of their pastas.